Richard is the founder of UK-based independent CRM consulting firm, Mareeba. He has been an independent CRM consultant since 2004 and has been working in the CRM industry for 20 years, during which time he’s been involved in over 300 CRM projects. 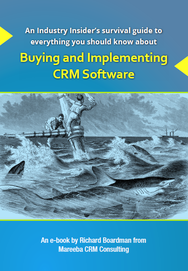 While CRM software can transform an organisation’s performance, it’s not as easy to do as many would have you believe.